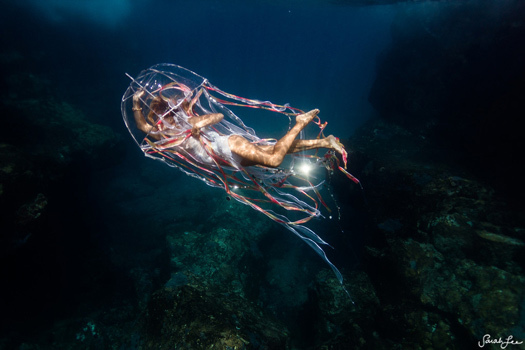 Sarah Lee, photographer, creates beautiful works of art that capture the interplay of people, water and light. Watch her video here, it’s part of a series by SmugMug*. The independent photo-sharing site is taking a behind-the-lens look at the world’s most exciting photographers. Ask your models to channel their inner ballerina or yogi and trust them. Open body posture is key. 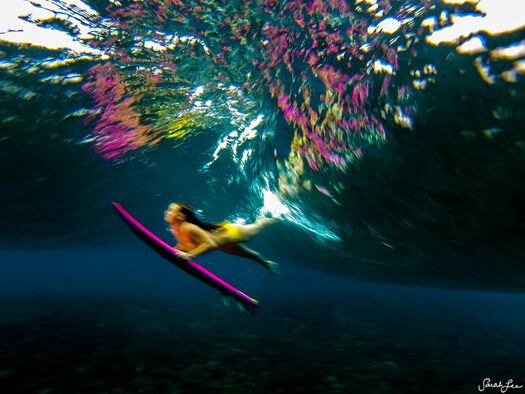 This photograph was taken of adventure model and soul surfer, Alison Teal, somewhere in the warm waters of Fiji. I find it ideal to photograph people underwater in the late morning between 8 and 11 because you’re going to need a lot of natural light being underwater. Though, on occasion it’s fun to experiment with different times of day. This photograph was taken during the last hour of the day, probably in the presence of a few sharks too shy to make themselves known. Skin tones look the best within 1-5 feet of the surface. Beyond that, and you start to lose the warmth and reds in their skin tone. Lately I’ve been using an Outex, which is a silicone water cover. It’s rad because you can use different lenses in it and it has a tripod neck strap. It’s worked really well underwater in lots of different situations. You don’t always need a fancy camera or underwater setup to take a good photo. This photograph was taken on a GoPro. Read more about shooting with a GoPro on my blog. 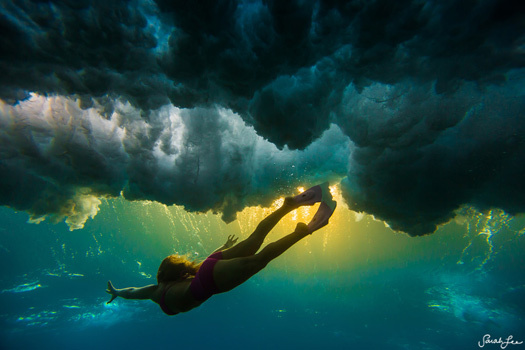 Within the realm of underwater photography, there’s not much in your control. It’s all about being in the moment and finding the composition within the “chaos”. Most of my favourite photographs were taken when I just let things “be” and used my camera as a way to interpret what is happening at the present moment, rather than trying to orchestrate and control any of it. Protect your gear. I alternate between surf housing and water covers depending on the conditions I shoot in. It’s an independent photo-sharing site that allows you to store, share, and sell your photos online. Trusted by millions, it offers fully-customisable photo websites (ecommerce-enabled and social-media-integrated) with gorgeous galleries and easy-to-order prints and gifts.